This trick I got from Dr. Haddon, who has published a description of it (see Rivers and Haddon, p. 152). In Murray Island, Torres Straits, it is known as Monan = a Lizard; in Mabuiag as Maita = Intestines of a Turtle. It was shown to Dr. Furness in the Caroline Islands by the Uap boy, who showed him "Carrying Money." 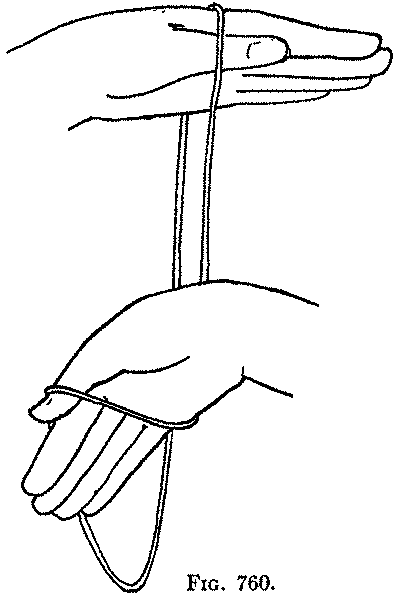 First: Hold the left hand high with the palm down and the fingers pointing away from you, and with the right hand place the loop of string over the back of the left hand, and let it hang down in front of you. 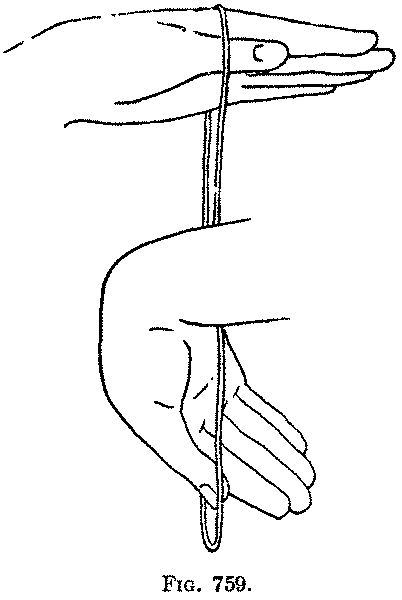 Pass the right hand away from you through the hanging loop, with the fingers pointing downward (Fig. 759); then turn the right hand around the right hanging string, by pointing the fingers to the right, then toward you, and finally upward (Fig. 760). 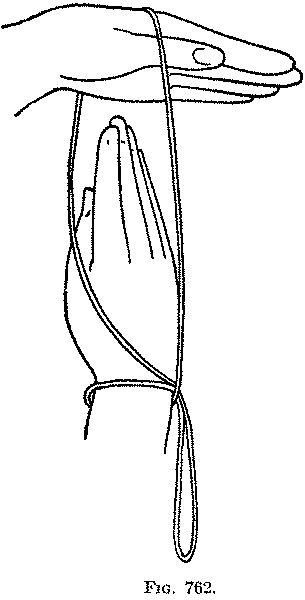 Now pass the right hand to the left, between the hanging strings and your body, beyond the left hanging string (Fig. 761), then away from you, then to the right around the left string (Fig. 762), and finally toward you back through the hanging loop (Fig. 763). 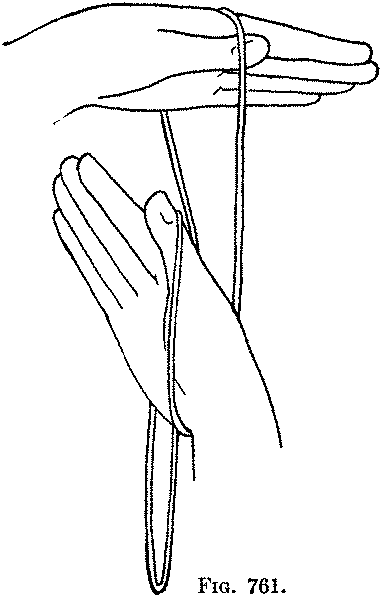 Draw the right hand down and to the right, and it will come free from the noose around the wrist. This trick is rather hard to learn and it can be done only in the one way I have described. Of course you will observe that you take your right hand out of the loop when you finally bring it toward you apparently through the loop.